Lori Kuczmanski, public affairs officer for the International Boundary and Water Commission, talks about new gates designed to block traffic from driving on the IBWC's levees during a news conference Tuesday August 8, 2017, in Pharr. PHARR — Be careful next time you decide to run along the levees as they are now off limits. That news coming Tuesday from officials with the U.S. International Boundary Water Commission, the federal government agency that manages the levees in Hidalgo and Cameron counties and other parts of the region, announced that local law enforcement would be stepping up enforcement along the levees throughout the county. 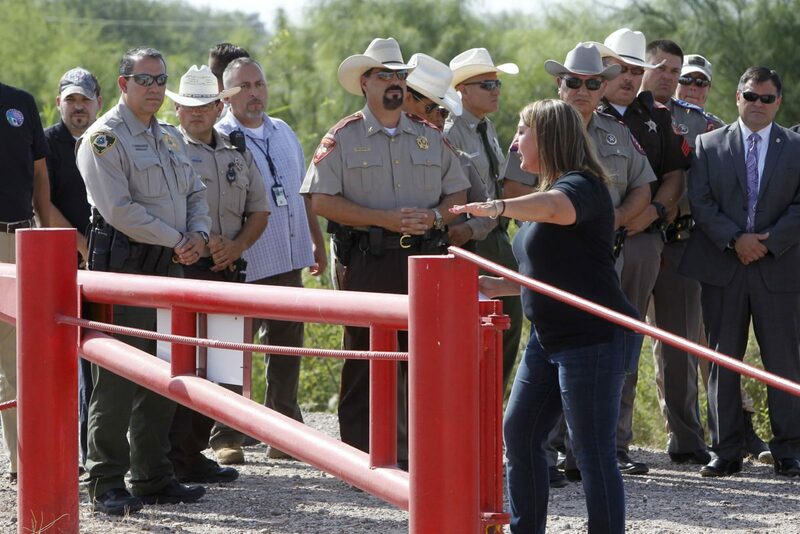 The new focus on enforcement comes at a time when multiple agencies at the local, state and national level are preparing for the construction of a new border wall in the region. The news conference in which enhanced enforcement was announced comes just one day after U.S. Customs and Border Protection officials issued a news release citing the Santa Ana National Wildlife Refuge as a staging area for human smuggling activity. 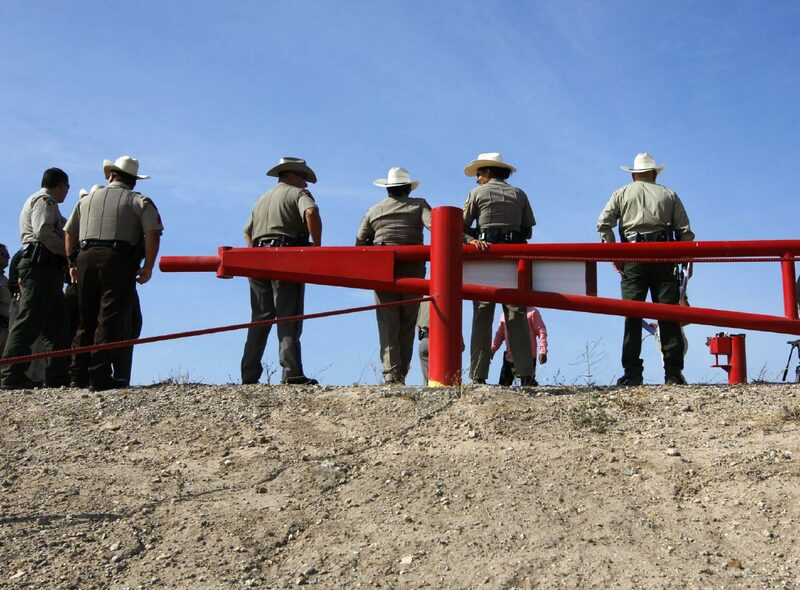 Law enforcement officers line up next to a new gate on the International Boundary and Water Commission flood control levee on Tuesday August 8, 2017, on Jackson Road in Pharr. The IBWC is installing more gates to prevent people from trespassing on the levees and asking local police to enforce law. The IBWC owns the levees on the main floodway and just north of the Rio Grande. The refuge is the same location that federal officials have begun work to build a border wall that is a centerpiece of President Donald Trump’s immigration policy. Officials in charge of the levees declined to discuss any issue relating to the wall, but did say that the plans for stepped-up enforcement follow a period of virtually no enforcement along the levee system. Citing increased illegal dumping and trespassing on the levees, IBWC public affairs officer Lori Kuczmanski said they would be partnering with local, state and federal law enforcement agencies, who will help enforce the laws along the levees, which include prohibited activities such as fishing and hunting, to name a few. Kuczmanski, who was flanked by law enforcement representatives including the Texas Department of Public Safety, CBP and Hidalgo County constables, said the levees have always been off limits to the general public but due to budgetary issues they were unable to secure the levees in the past. As it stands, Kuczmanski said only law enforcement officials, irrigation district employees, ranchers, farmers and their staff, are allowed on the levees. “We will work with individuals on a case-by-case basis if they need to be on the levee,” Kuczmanski said. Sgt. Dan Broyles of the Precinct 3 Constable office said they would not prevent people from accessing their own private residences or commercial businesses. The IBWC official said they’ve received complaints about people illegally dumping trash or trespassing on the levees and floodways. Such acts could lead to citations for trespassing and arrests for those illegally dumping trash. Kuczmanski said the new enforcement also includes the levees near the river, but said they don’t have as many issues with those levees because of the U.S. Border Patrol presence along the area. The announcement comes a day after CBP officials said in a release that they had arrested two U.S. citizens in connection with a smuggling attempt that originated from the Santa Ana National Wildlife Refuge. The statement from CBP officials comes at a time of heightened focus on the refuge, a more than 2,000-acre swath of trails that is home to more than 400 species. The attention placed on the refuge that draws approximately more than 165,000 visitors from all the over the world annually, came after news that the federal government had designated the refuge as a priority location for the construction of a border wall. “Due to the large expanse of wooded area, proximity to the Rio Grande and limited access by Border Patrol, transnational criminal organizations exploit this area to engage in criminal activity,” the release stated. Environmentalists argue that irreparable harm could be done to the refuge and the species that call the land home if they were to build it on the levees that separate the refuge’s visitors’ center and the land.